One of the bodies on display at the Body Worlds Exhibit at Quincy Market in Boston in 2013..
Joe Gold heads up the Gold Group, a marketing firm which organizes educational exhibits for museums across the nation. The group's been contracted by the Portland Science Center to present a show called "Body Worlds." "It really is the most spectacular, the most interesting, exhibit I have ever seen, and I've worked on the Vatican exhibit, and King Tut and Cleopatra and the Dead Sea Scrolls and there is nothing that compares to Body Worlds," Gold says. Body Worlds first appeared in Japan in the late 90's, says Gold, and has since been displayed in major cities throughout the world to more than 40 million people, making it the most popular exhibition of all time. It uses a technique developed by German scientist Gunther Von Hagens called plastination, a method of halting decomposition and preserving cadavers by replacing bodily fluids with plastics such as silicon rubber. Once treated with heat, light and various gases, the specimens become rigid and permanent. Often displayed with the skin removed, the exhibits enable people to view, in graphic detail, the inter-connectedness of the human body. Joe Gold - who has put on Body Worlds in many venues across the U.S. - says visitors to the Portland Science Center will see 250 body parts and 15 full bodies on display in a 12,000-square-foot space. "Anything ranging from healthy lungs to smoker lungs," he says. "We have slices of the human body that show how fat affects the human body. We have a brain affected by Alzheimer's. We show how a hip replacement is put into the body." A scene in the Body Worlds exhibit at Quincy Market in Boston in 2013. Body Worlds has been criticized for being overly ghoulish and unethical, trivializing death and turning it into entertainment. But Gold points out that all the bodies and organs on display are from donors, and that there are still 50,000 living donors out there willing to give up their mortal remains to the cause when the time comes. Furthermore, Gold says seeing Body Worlds can have a positive impact on people's lives. "People coming to Body Worlds have written to us later at the museums at which it appeared and said, 'Thank you for presenting this, it really let me see how my smoking has affected by body, it let me see how my over-eating or poor eating habits or my lack of exercise can affect the human body, and because of that I have changed my lifestyle,' " he says. "I think the controversy that surrounds the initial plastination experiments is a little unsettling at first, but I actually think the exhibit does a great job of getting people excited about science and about their own bodies," says Kristy Townsend, a neurobiology professor at the University of Maine. She saw Body Worlds in London about seven years ago, and says she'll encourage her students to see it when it comes to Maine. "I do think for people interested in a career in medicine, this is maybe one of the first times they can see inside the human body," Townsend says. "So I think it's a great opportunity for pre-med students." And it's not only scientists who are interested in plastination. Kris Engman teaches an art class at Colby College in Waterville, concentrating on figure drawing and anatomy. Reached by cell phone, she says she plans to visit the Body Worlds exhibit more than once. "It answers to some sort of a mysterious quality," Engman says. "I mean, we all know that we have muscle groups that make us do the things that we want but we rarely get a chance to see them." Body Worlds will be coming to Portland when the city's new science center opens its doors within the next month or so. 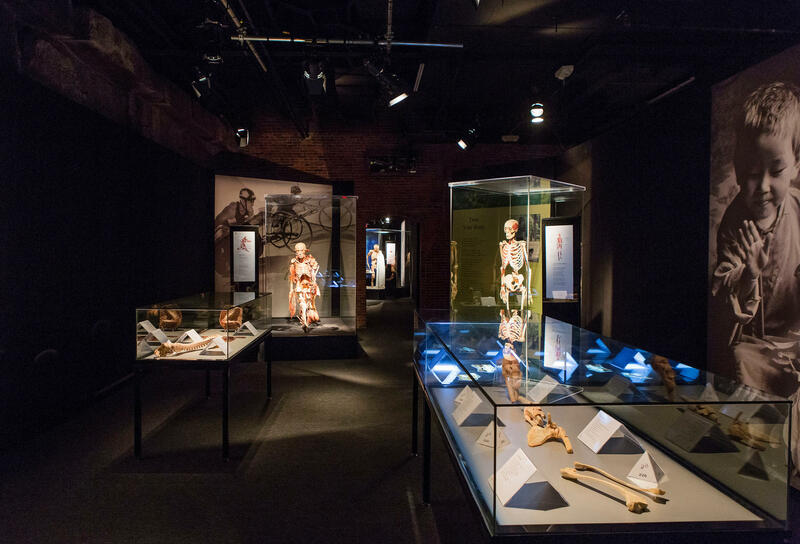 Learn more about the Body Worlds exhibit.